iPed™ 7G 2019 for Windows: Great Pedigrees, Great Price. 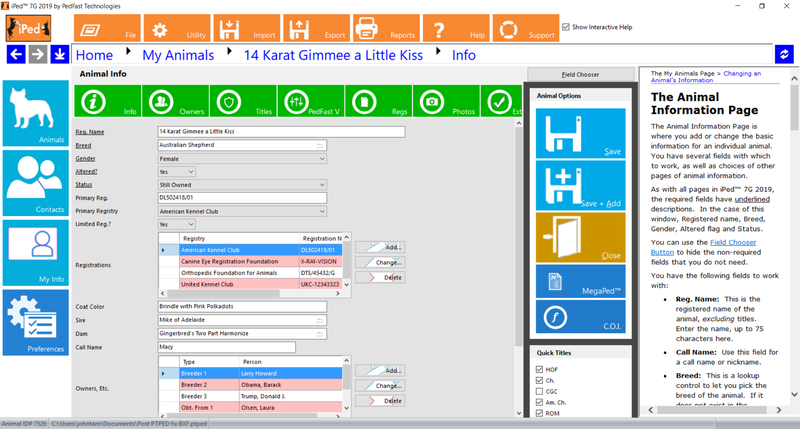 You want to use your computer to make pedigrees, but do not need the powerful features of a full-blown Kennel, Cattery or Stable management program. You also do not want the price tag of these powerful programs. You are looking for excellent pedigrees, pure and simple. PedFast Technologies has heard you and answered your needs. iPed™ 7G 2019 rapidly prints beautiful pedigrees. It offers several useful features not found in other pedigree programs. Most importantly, iPed™ 7G offers you a great price: only $59.99 plus S&H! We are proud of our latest low-cost achievement. 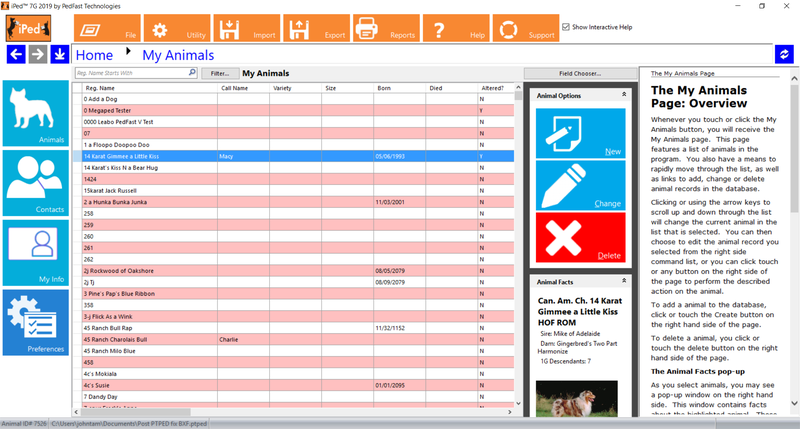 New Reporting features - The first iPed™ with reporting on the animals in the database. New Interactive Help Every window can show a panel with help for the part of the program you are using. Easily. Automatically. Our single-file, easy-to-back up database format, .PTPED. Instead of complex backup and restore operations, you can simply store the .PTPED database file in your documents folder, and make backups with any stick drive, DVD, or even better with Carbonite® secure cloud-based backup. Wright's Inbreeding Coefficient to ten generations, including a display containing ancestor contribution for every connection between Sire and Dam found in the pedigree. All New Complete Program Help (the iPed™ 7G 2019 user manual is available by PDF). Font sizing that works in most windows to make touch easier, and also to help those with vision issues. Huge Capacity iPed™ 7G 2019 has the capacity to store up to 2.1 billion animals in its database! Competitors at three times the price offer you only 65,000 animals! Click on thumbnail for full-size image iPed™ 7G 2019 follows the lead of its big-sister flagship programs, and offers the finest in ease-of-use. Everything is easy-to-read with our new larger display and touch-friendly, windows 8+ modern look and feel. 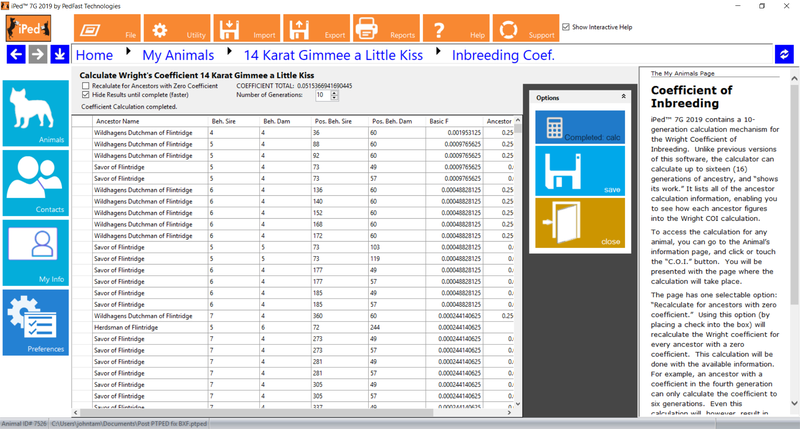 Click on thumbnail for full-size image iPed™ 7G 2019 stores multiple owners, breeders, providers, all with a built in contacts database. iPed™ 7G 2019 enables you to set up complex titled names with ease. A name like Am. Can. Mex. Ch. LacShen FancyFeat L'Emperor ROM HOF is a piece of cake with our extra-powerful software. You can also store many species in the database. We support dogs, cats, horses, birds, sheep, steers, rabbits guinea pigs, swine, ostrich and more. Data Sharing with Others iPed™ 7G 2019 supports PedFast Technologies' BXF(tm) format, the only pedigree exchange format that will not disrupt the integrity of your own database when you import someone else's data. BXF is supported by all of our flagship programs ! You can also export from iPed™ 7G 2019 and share with friends. We support import/export better than any other company's product. We also support free convertors from many older pedigree programs, that enable you to move up to iPed™ 5G 2015 without re-keying your data. Click on thumbnail for full-size image Among low-cost pedigree programs, only iPed™ 7G 2019 offers the certified accurate Wright Inbreeding coefficient calculation of our powerhouse flagship programs, at no extra cost! Calculate the coefficient of inbreeding for any animal up to 10 generations, easily, with one click of a button. See our detailed calculations on the all-new ancestor contribution display. PedFast™ V Speedy five generation Pedigree Entry! Click on thumbnail for full-size image iPed™ 7G 2019 has the power not only to print outstanding pedigrees, but to enter then rapidly. Enter 63 ancestors from one window with the power of PedFast IV?! Set up like a pedigree form, PedFast V takes much of the tedium out of pedigree entry. 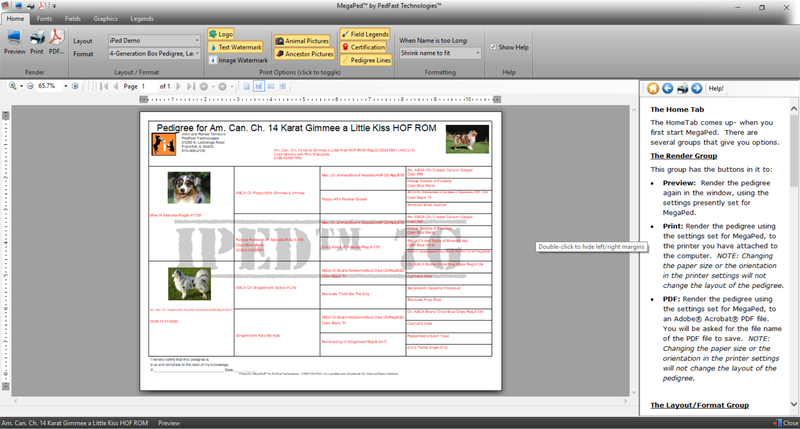 You can zoom back and forth in pedigrees with a click of the right-hand mouse button. You can enter names, with duplicate prevention built in. As a matter of fact, as you enter a name, if it's there, PedFast will show it to you, and when you leave the field will even display its ancestors on the spot! We think of ease-of-use so you can think about your pedigrees and not how to operate the program. iPed™ 7G 2019 contains built-in help on every function in the program. There are illustrations and details packed into the help, which is available from every page of the program. Even better, there is a button to connect you with our product support system, whic gives you access to FAQ and support ticket entry capabilities. Support help is but a click or touch away. MegaPed™ for iPed™ 7G 2019 uses custom-designed formats to empower you to create the most stunning pedigrees you can imagine. With a simple interface, tight integration with iPed™ 5G 2015 and flexibility unequalled in any program available today, MegaPed is the answer to virtually every pedigree question. Multiple formats: MegaPed 7G 2019 ships with ten layouts, including box pedigrees and a picture pedigree that shows the picture for every animal in the pedigree! Plus there are over 150 layouts in the optional Pedigree Power Packs™, and you get a 14 day trial of all of them when you install! Drag and Drop Configuration: From a list of over 20 fields, plus all registries in iPed™ 7G 2019, you can drag and drop them onto any one of three lines for that animal. This means that you can custom-design the information shown in the pedigree for each animal, including typing in the headings you want, where you want them. Multiple Logo Graphics: You can store up to 65,535 different logo graphics and choose which one to put on your pedigree. Windows Vista, 7, 8, 8.1, 10 or newer, or Windows Server 2008 or newer. Self-updating program with AutoUpdate™ III. 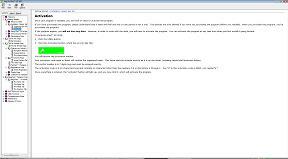 Built-in help on all windows and messages. Self-installing CD-ROM with PDF copy of help/owner manual included! An excellent value at only $59.99 (upgrades are $29.99)! Free Trial! Try it now! Click Here to access the signup for our free trial. You can then immediately see the magnificent value that iPed™ 7G 2019 represents. You can try iPed™ 7G 2019 for 14 days at no cost or obligation. Simply download it from our web site and run it to easily install. Outstanding Support! Our unparalleled service includes online product support at no charge, a free library of downloadable pedigrees on our web site, support database, email support, and all of this is available to demo users as well as purchase customers! Buy now! iPed™ 7G 2019 is available immediately. You can order it online using our secure ordering forms, right now, right away. Click here for our secure ordering page. PedFast Technologies has been providing outstanding value in animal-related software since 1991. iPed™ 7G 2019 continues our long tradition of excellence. Buy Today and see for yourself how excellent iPed™ 7G 2019 actually is, and what a bargain we offer you. Do you have to have a touch screen to use iPed? No. A touch screen is not required. Does iPed have Genetic calculations? Yes. It contains the Wright Inbreeding coefficient calculator, that will go back up to ten generations to find common ancestors behind both Sire and Dam. Does iPed 7G work with the Pedigree Power Packs™? Yes! 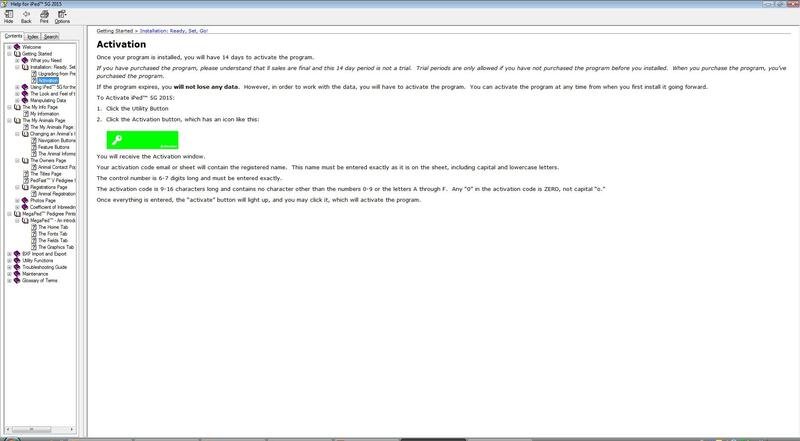 When you install for the first time, you get a 14-day trial of the packs built-in. On purchase, you instantly activate them using MyActivate™! Does iPed 7G work in Windows 10? Yes. And now, you no longer need the NET 3.5 framework feature turned on. I have an older version of Compuped. Does iPed 7G qualify for the upgrade price, and can you convert my CompuPed 4.x or newer database to iPed? Yes on both, and the conversion is free. I have an older version of Breederware. Does iPed 7G qualify for the upgrade price, and can you convert my breederware database to iPed? We did not publish Breederware, so the normal price (or sale price) applies. However, we can convert old Breederware to iPed-useable format and the conversion is free. If you have a group of ten or more, please contact us and we will happily negotiate a discounted price. I don't want to download. Can you ship me a CD or USB? Yes! (there is a cost).